If you’re looking to take your training to the next level then the Rim Rockin’ Basketball Hoop just might be the item for you! 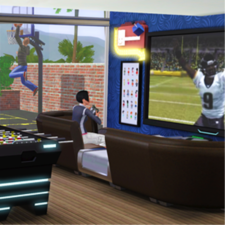 More than just a way to show your Sim's athletic prowess, it’s a way to show your Sim's complete and utter sports dominance! Challenge other Sims to a friendly game of hoops, or shatter the backboard with the epic dunking contest! 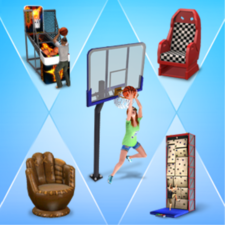 Build your Sims’ fun and athletic skill while practicing to for your next hoops challenge. Train other Sims to be just as amazing at hoops as your Sim! Get the new “Rim Wrecker” moodlet by dunking so hard your Sim shatters the backboard! Dominate your opponent with a one on one dunking contest!